Some sites where purchasing Original Laptop Pc games are indeed very many. There are even some online stores that sell original games. But there are 3 websites where you buy the biggest Original Game, including Steam, Origin, and Uplay. These three websites are places to buy original games to be played on PC or Laptop computers. It has been proven from the security and ease of buying games, so it's no wonder the three websites are a favorite for gamers around the world. 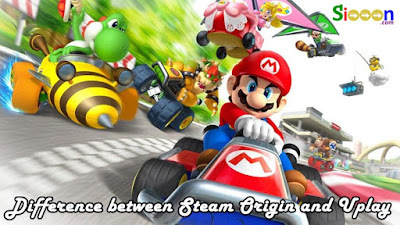 Based on the number of users or buyers, the best site to buy original games is Steam. Besides that Steam always holds big discounts for its visitors, besides that purchasing on Steam is very easy and there are several forms of purchases such as Code for Activating Games, Gift from fellow Steam users. Payment can also use a Credit Card, one of the most preferred payment methods. This site belongs to Games Electronic Arts Developer and Publisher, of course, on this website, it sells various exclusive games such as Need for Speeds, The Sims, Fifa, Mass Effect and many more. Even some games like Fifa are not available on other websites even on Steam. So it's best to buy games from Electronic Arts as well as on Origin because in addition to being more complete there are always interesting offers. Just like Origin, the difference on this site is that many games from Ubisoft sell like the most famous Assassin's Creed, Far Cry, The Division. Although some are exclusive only in Ubisoft but when big days like Christmas or New Year games from Ubisoft there are always promos on Steam. Still, the attractive promo for the game from Ubisoft is directly buying it on the Ubisoft Website. That is the difference from the site that purchases games that are very popular, hopefully it can be useful for you, especially for those who happen to want to buy a game. Thank you for visiting, hopefully it's useful. Sorry if there is an error in writing.